Transit • Price hike starting April Fool's Day leaves just a few U.S. cities with higher fares. Scott Sommerdorf | Tribune file photo A TRAX train passes West Valley City Hall as it leaves the West Valley Central Station on the newly opened green line in August 2011. It&apos;s no joke: An increase on Monday  April Fool&apos;s Day in Utah Transit Authority fares for buses and trains will bring prices that are among the nation&apos;s highest. The base fare for a single adult trip on buses or TRAX will jump from $2.35 to $2.50. That is the final of three increases over two years approved in 2011 when the base fare was $2. Few transit agencies in America charge more than that, according to a 2012 survey by the American Public Transportation Association (APTA) and searches by The Salt Lake Tribune of transit websites to identify any recent hikes. Of 169 U.S. transit agencies that participated in the APTA survey, only five will now have higher base fares for buses than UTA. They are in New York City, $2.75; San Francisco, $4; Nashville, $4; Sugar Land, Texas, $3.50; and Eden Prairie, Minn., $3. Another four systems match the $2.50 to be charged for buses by UTA. They are in Atlanta, Pittsburgh, Portland and Sacramento. The 2012 APTA survey said the median base fare for buses among U.S. transit agencies was $1.50 per trip. 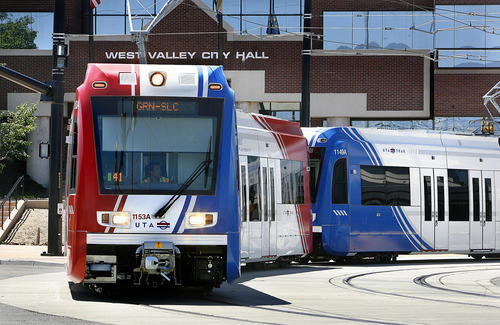 UTA&apos;s TRAX also will have among the highest fares nationally for light rail. No agency included in the 2012 APTA survey now has fares higher than the $2.50 to be charged by UTA  but four match it. They are in Sacramento, San Diego, Pittsburgh and Dallas. Of 21 light-rail agencies surveyed by APTA in 2012, the median light rail base fare was $2 a trip. That means among transit systems nationally that have lower bus or train fares than UTA are such places as Chicago, Los Angeles, Phoenix, Denver, Philadelphia, Cleveland and Dallas. Despite such findings by The Tribune, UTA General Manager Michael Allegra told the UTA board on Wednesday, "As we have inventoried transit systems in the western United States, we&apos;re in the same ballpark" for fares with comparable systems. Andrea Packer, UTA chief communications officer, told the newspaper that the APTA survey did not include some systems in the West that have more expensive fares than UTA, including those in Las Vegas and Seattle. Allegra also told the UTA board that many systems with lower fares than UTA "receive more in sales taxes" to help subsidize their systems. He also said UTA  which covers the Wasatch Front from Brigham City to Payson  has longer trips on average than most systems, so riders get longer rides for their money. That also tends to raise fares here. Two years ago, when the series of fare hikes was approved, Allegra said UTA plans to move to a system that will charge higher fares for greater distances traveled instead of flat rates for all trips on most buses and TRAX. FrontRunner already charges higher fares for longer trips. He said then that the agency has been implementing electronic-payment systems that would allow such a setup, including "tap on, tap off" electronic cards that riders touch at the beginning and end of trips to have their fares automatically deducted from the card. Packer said Wednesday that no firm timetable has been set for converting to such a system. She said UTA is still working on technology to allow that, and the agency will have a series of public hearings and outreach before any implementation. UTA has a long list of 36 different fare types that will go up Monday. The adult monthly bus/TRAX passes will rise from $78.50 to $83.75. The FrontRunner base fare will increase from $2.35 to $2.50, and the charge for each additional station will go from 55 cents to 60 cents. The maximum from Provo to Pleasant View on FrontRunner will jump from $9.50 to $10.30 a trip. Also, the low-income discount Horizon monthly pass will rise from $50 to $62.75; ski buses will increase from $4.25 to $4.50; buses from Salt Lake City to Park City will bump up from $4.25 to $4.50; and Paratransit bus service for the disabled will go from $3.50 to $4 a trip. The full list of all UTA fare increases that take effect Monday is available online at bit.ly/utafares.